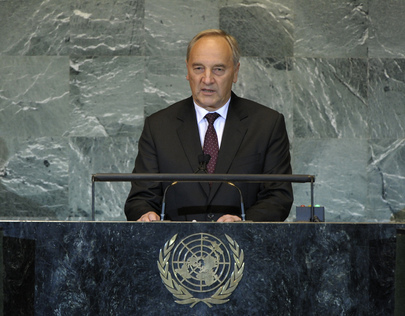 ANDRIS BĒRZIŅŠ, President of Latvia, said the Organization must adapt to sustain its influence as the only truly universal international body. It was essential to revitalize the General Assembly and to reform other principal organs to keep pace with modern realities. He welcomed the Security Council initiative to cut the Organization’s budget for 2012-2013 by 3 per cent, and said reform of the Security Council was long overdue. “Latvia is ready to assume greater international responsibility and is planning to engage more actively in the work of the UN Security Council by putting forward its candidature for the non-permanent seat,” he said. He said that in the 20 years since Latvia regained its independence and joined the Organization, it had emerged as a democratic society that respected rule of law and human rights. “Now we are able to share our transformation experience by helping other countries in their own development,” he said, calling on the international community to support the street demonstrations in North Africa and the Middle East, so that their people could build stable, trusted democratic institutions and the rule of law. Israel and Palestine should resume dialogue without delay, and the international community must help them reach a two-State agreement that took into account both parties’ legitimate interests. The economic crisis reminded all that today’s world was interdependent, he said, adding that Latvia was deeply worried by the level of uncertainty and volatility in trade and financial markets. “My country, Latvia, was one of those hit first and hard by the crisis, but now is among the countries that is steadily recovering,” he said. The recovery of the Latvian economy could teach several simple lessons. Firstly, the importance of acting quickly and decisively in adopting austerity measures; secondly, to carry out structural reforms, there was a strong need to communicate and to engage with society; and finally, the value of international solidarity. In the face of transnational threats, including terrorism, regional actors and organizations were increasingly important, he said. The European Union, OSCE, as well as the United Nations must continue to work towards peaceful settlements of protracted European conflicts in Transnistria, Abkhazia, South Ossetia and Nagorno-Karabakh. The review process of the Human Rights Council had been a unique opportunity to improve its performance and credibility, but much more could have been done; its members must fully commit to promotion and protection of human rights. “Latvia attaches the greatest importance to this commitment by putting forward its candidacy for the Human Rights Council elections in the year of 2014,” he said.